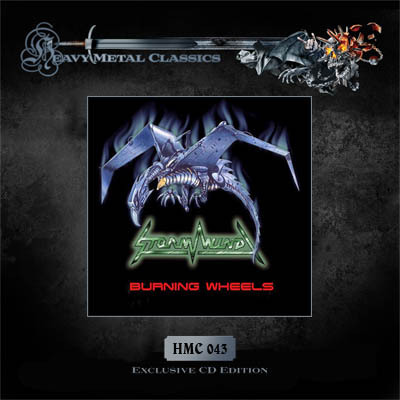 The release date of the of the album “Burning Wheels” by the German heavy metal band Stormwind on CD is on 22nd of June 2018. The pre-order phase will start here on 8th of June 2018. The album will be released in a limited Edition of 500 copies (hand numbered), with 5 Bonus tracks, certificate and hologram. The 2nd unreleased album from the northern German Metal-Band is finally available on CD! Pure Steel Records did this 80′s re-release in the usual high quality Karthago Classics Series. Inevitable for all fans of Accept and similar styles! Stormwind is German heavy metal band formed in Düsseldorf in 1980. Before they split up in 1986, the band released one full length album “Taken by Storm” (1984, Wishbone Records) and EP “Warbringer” (1985, Wishbone Records). “Burning Wheels” is spectacular come back of German metal warriors: Niko Arvanitis-guitars (ex Warlock), Rudy Kay-bass, Klaus Lemm-vocals (ex Darxon), Wolfgang Böhm-guitars (ex U.D.O., ex Universe, ex Darxon, ex Snakebite) and Olly Kliem-drums (ex Energy).